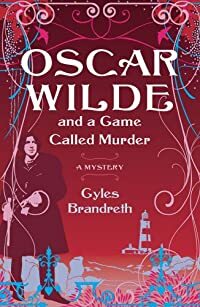 Oscar Wilde and a Game Called Murder by Gyles Brandreth: Synopsis and Online Purchase Options. Synopsis (from the publisher): It's 1892, and Oscar Wilde is the toast of London, riding high on the success of his play Lady Windemere's Fan. While celebrating with friends at a dinner party he conjures up a game called "murder" that poses the question: Who would you most like to kill? Wilde and friends — including Arthur Conan Doyle, Bram Stoker, and poet Robert Sherard (the novel's narrator) — write the names of their "victims" on pieces of paper and choose them one by one. After leaving the party, Wilde scoffs at the suggestion that he may have instigated a very dangerous game indeed. The very next day, the game takes an all-too-sinister turn when the first "victim" turns up dead. Soon Wilde and his band of amateur detectives must travel through the realms of politics, theatre, and even boxing to unearth whose misguided passions have the potential to become deadly poisons...not only for the perpetrator of the seemingly perfect crimes but also for the trio of detectives investigating them.